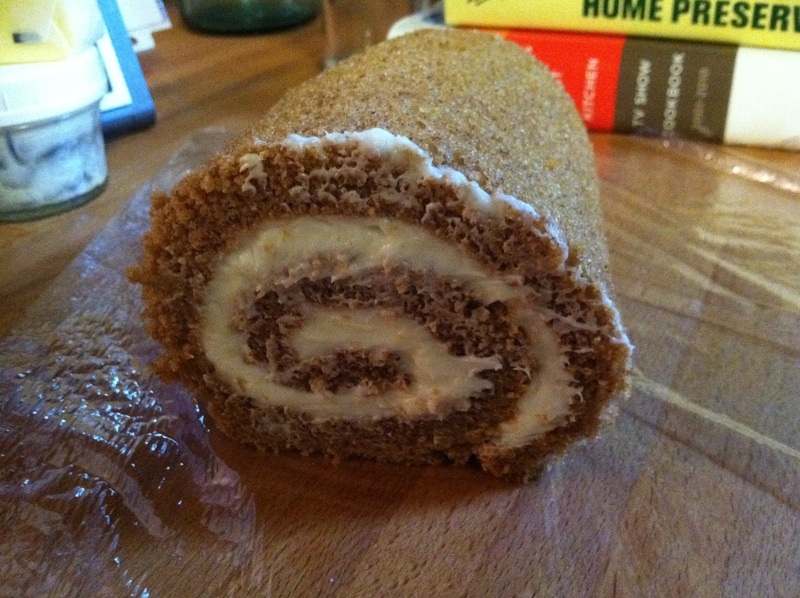 Don’t be intimidated, it’s just a pumpkin roll! I’m not sure why, but some people are intimidated by anything that involves rolling up a thin cake with a filling inside. Sure, there is always the possibility that the cake can crack or filling can ooze out, but is that really a cooking failure? You can still eat it! It will still taste delicious even if it doesn’t look as pretty as you think it should. That being said, as long as you follow the basics and have a nice moist cake, pumpkin rolls and jelly rolls are easy peasy! This recipe is an adaptation of the Cook’s Country recipe. They know their stuff. I love Cook’s Country – they take all the guesswork out of it for you and stop you from wondering when trying a new recipe if it’s going to be worth it. This is because they are already giving you the best tested version of it! I only use a double batch of the cream cheese filling for this as I like to be able to still taste the pumpkin in the cake, but don’t feel the single batch is enough filling. Feel free to use the single batch recipe below, or double like I do. Adjust oven rack to the middle position and heat oven to 350 degrees. 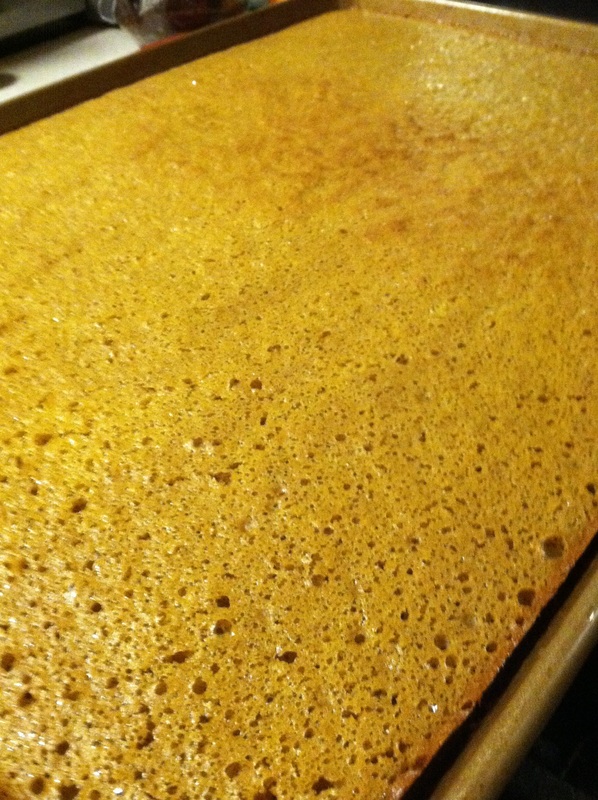 Grease and 18- by 13-inch rimmed baking sheet and line with greased parchment paper. Whisk flour, spices, baking soda, and salt in medium bowl; set aside. With electric mixer on medium-high speed, beat eggs and sugar until pale yellow and thick, 6 to 10 minutes. Add pumpkin and mix on low until incorporated. Fold in flour mixture until combined. Bake until cake is firm and springs back when touched, about 15 minutes. 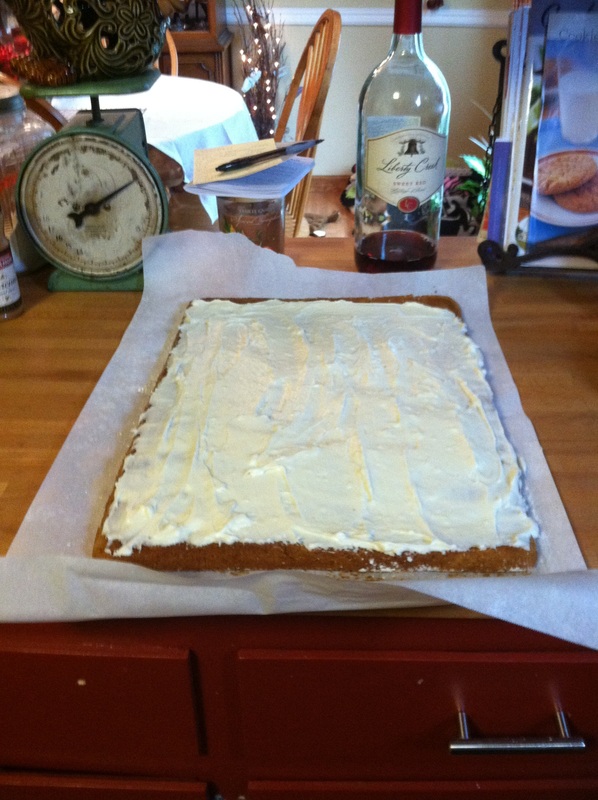 Before cooling, run knife around edge of cake to loosen, and turn out onto clean sheet of parchment paper that has been dusted with confectioners’ sugar. Gently peel off parchment attached to cake and discard. 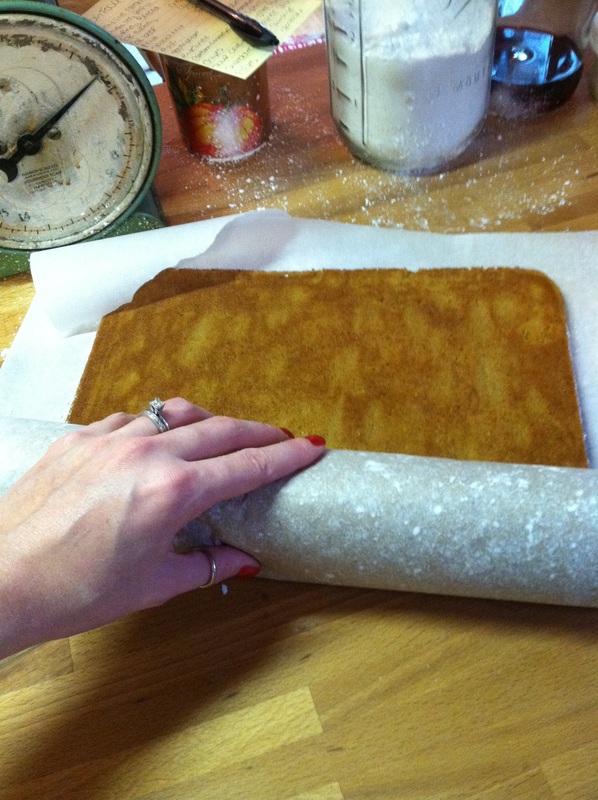 Gently unroll cake and spread with frosting, all the way to the edges, leaving 1inch of space at the far end. 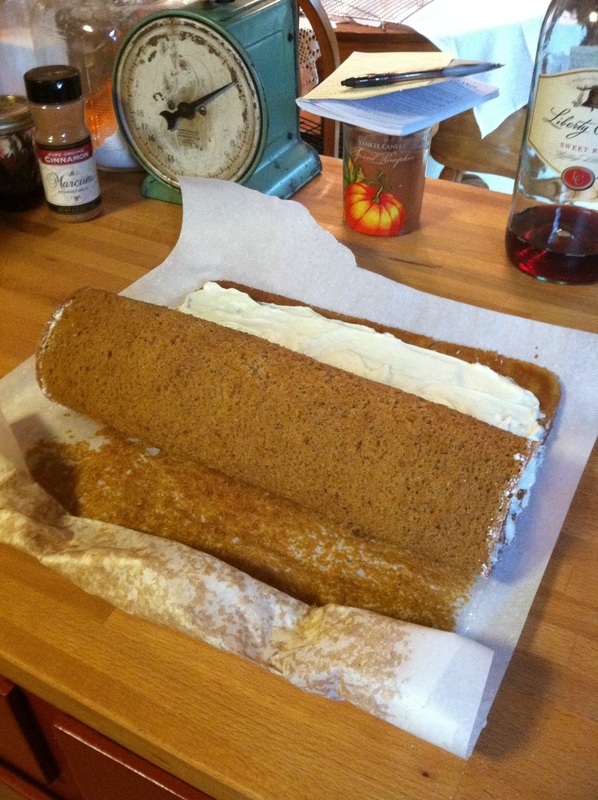 Re-roll cake snugly, leaving parchment behind. Slice off rough ends (and eat them like it’s your job!) Wrap cake firmly in plastic wrap and chill completely, at least 1 hour or up to 2 days. I slice mine in half and freeze each piece wrapped in a double layer of plastic wrap to enjoy later! With electric mixer on medium-high speed, beat butter and confectioners’ sugar until light and fluffy, about 2 minutes. Add cream cheese one piece at a time, beating thoroughly after each addition. Add vanilla and mix until no lumps remain. I served up this punch at a ladies party I had at my house recently – it was a unanimous hit! Not one person tried it and didn’t like it – none that admitted it anyway! Obviously, you have to be a fan of pumpkin to enjoy this punch. 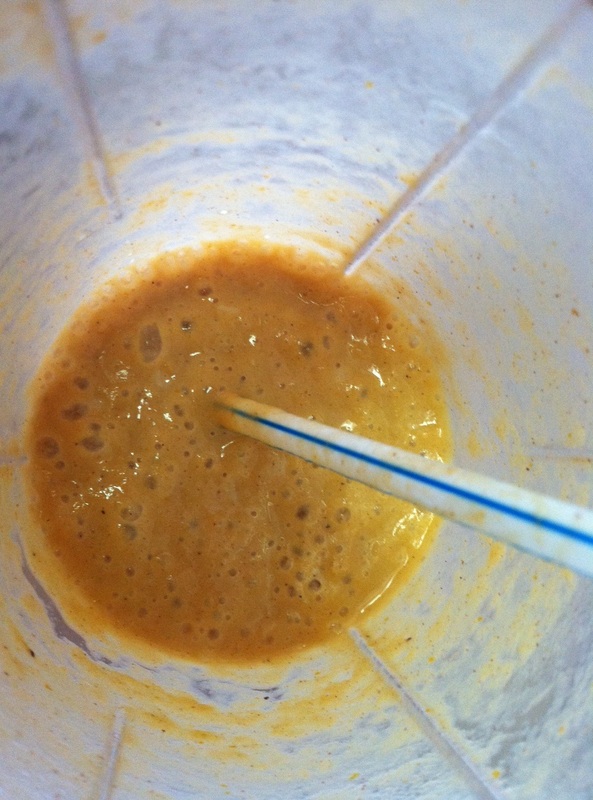 It is loaded with pumpkin flavor, kind of like pumpkin pie in a glass, but less sweet. Next time I make it i’m toying with adding about 1/2 cup whipped cream vodka along with the spiced rum to make it even more pumpkin pie like. Whatever you do, don’t sub ground cinnamon for the cinnamon sticks. It creates a gritty substance that is hard to strain out, and will also alter the color of the punch. This would be a great companion to Thanksgiving, so I’m thinking about making a double batch – one for home, one to take! Enjoy! Combine 12 cups water, brown sugar, pumpkin, and cinnamon sticks in a large pot and bring to a boil over medium-high heat, stirring until the sugar dissolves. Bring to a boil. Add lemon peel and let simmer for 15 minutes. Let mixture cool, then refrigerate until the liquid is cold and the pumpkin pulp settles to the bottom, 2 to 3 hours, or overnight. Working in batches, ladle the liquid into a fine-mesh strainer set over a bowl or pitcher. Discard the pulp and lemon zest. Return the cinnamon sticks to the punch, add the spiced rum and refrigerate until ready to serve. Serve over ice and add a cinnamon stick if you so desire. This can be made without the rum as well for a non-alcoholic version. Breakfast or dessert, you decide. 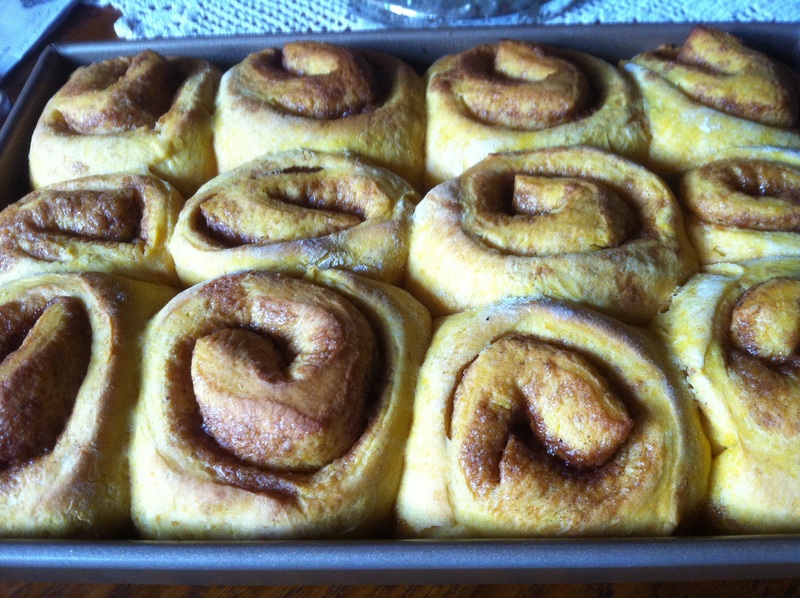 I choose both for these pumpkin cinnamon rolls! I know, I know. Another pumpkin recipe. But it’s one of my favorite flavors and just says “fall” to me. Yes, the pumpkin speaks to me, so there. 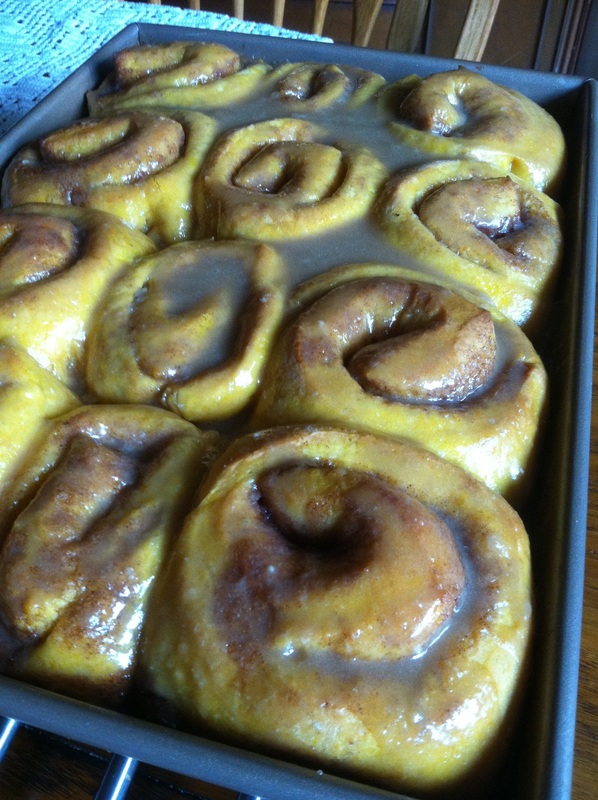 And the most fabulous thing about these pumpkin cinnamon rolls, other than them tasting fantastic enough to make my husband make moaning noises while stuffing one of these into his pie hole, is that there is NO KNEADING! Happy! Happy! Joy! Joy! I made these this past saturday while I was cleaning the house. I mixed up the dough, let it rise for an hour. Slapped on the filling, rolled them up and let them sit for about 30 minutes before popping them into the oven for 25 minutes. 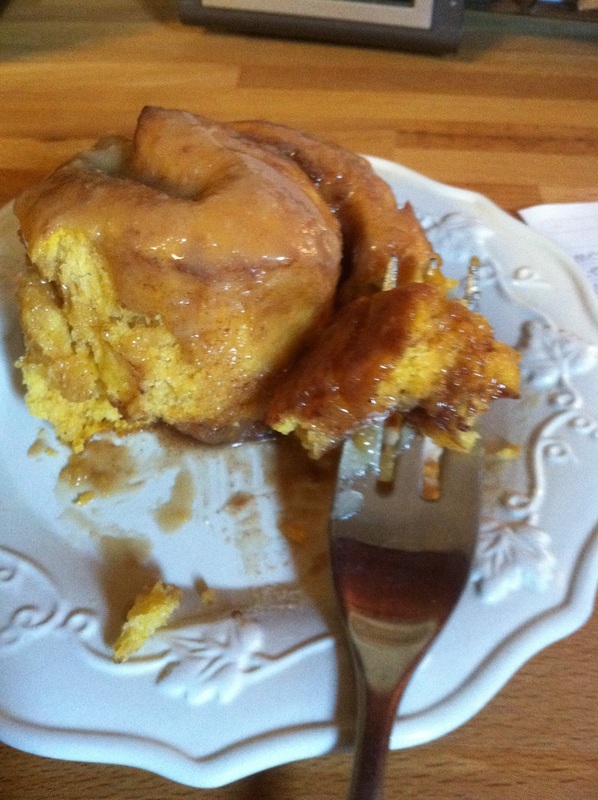 The original recipe is one from The Kitchn, but I had to edit it as they glaze sounded too sugary, I didn’t feel there was enough cinnamon flavor in the filling, and they didn’t say anything about adding the yeast to warm water – the warm water helps activate the yeast. So below is my edited version, and I hope that you enjoy it as much as we do! If you want, you can skip the glaze because they’re good all by themselves….but I added to the glaze because i’m a rebel like that. Based on what you’ve told us so far, we’re playing this track because it features electronica roots, trip hop roots, rap influences, beats made for dancing and surreal lyrics. Let the milk mixture cool until you can touch it – I speed up the process by putting the mixture in a cold bowl that has been placed in the fridge for about 10 minutes.Stir in the yeast and pumpkin. Add the salt and five cups of the flour all at once, stirring until all the flour has been absorbed – I used a dough whisk to speed up the process. The dough will be sticky, but should come together in a shaggy ball. If it’s still more the consistency of cookie batter, work in an additional 1/2 cup of flour, 1/4 cup at a time. Cover the dough and let it rise for 1-3 hours in a warm place. Your dough will double in bulk. To shape the rolls, sprinkle your work surface with a little flour and drop the dough on top. Pat it down into a rough rectangle and using a floured rolling pin, roll it into a rectangular shape about a half an inch thick, longer than it is wide. Sprinkle more flour as needed to keep the dough from sticking. Melt the butter in the microwave and stir in the brown sugar and the spices. Spread mixture over dough, leaving an inch of bare dough at the top and about 1/2 in on the edges. Starting at the edge closest to you, roll the dough into a cylinder and pinch it closed at the top. Spray your baking dish(es) with nonstick cooking spray . Using a sharp knife, cut the cylinder into individual rolls 1 – 1 1/2 inches thick. 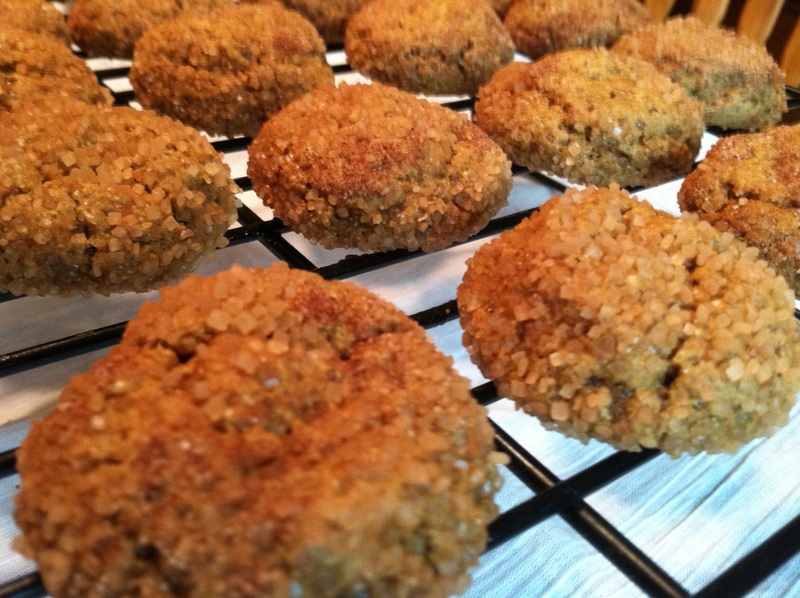 Place them into your baking dishes so they have a little room on all sides to rise. Cover with a clean kitchen towel and let rise until they have puffed up, about 30 minutes. They will rise more in the oven so don’t worry if they aren’t touching yet. Ten minutes into your dough rising, preheat your oven to 375 degrees. When ready, bake rolls for 20-25 minutes, until the tops are golden and starting to get toasty at the edges. Prepare the glaze – In a small saucepan over medium heat, combine the milk and butter. When the butter has melted, add the brown sugar and salt. Stir until the brown sugar has melted. Stir in the powdered sugar and whisk to remove any chunks of sugar. Glaze will be pourable but not overly runny. Let the baked rolls cool for about five minutes and then pour the glaze on top. Eat right away. Share if you feel like it. Any leftovers can be reheated in the microwave for about 30 seconds. These also freeze well, just double wrap in saran and then a layer of foil. I must admit, I am smitten with this idea. Single servings of dessert at hand, totally ready to be made portable if needed or to send home with guests and a party favor. For those of you that are skeptical about the idea of cooking individual pies in mason jars, you can still follow this basic recipe using your pie plate. It will work with the same result, but I will warn you – it’ll be a lot less cute. 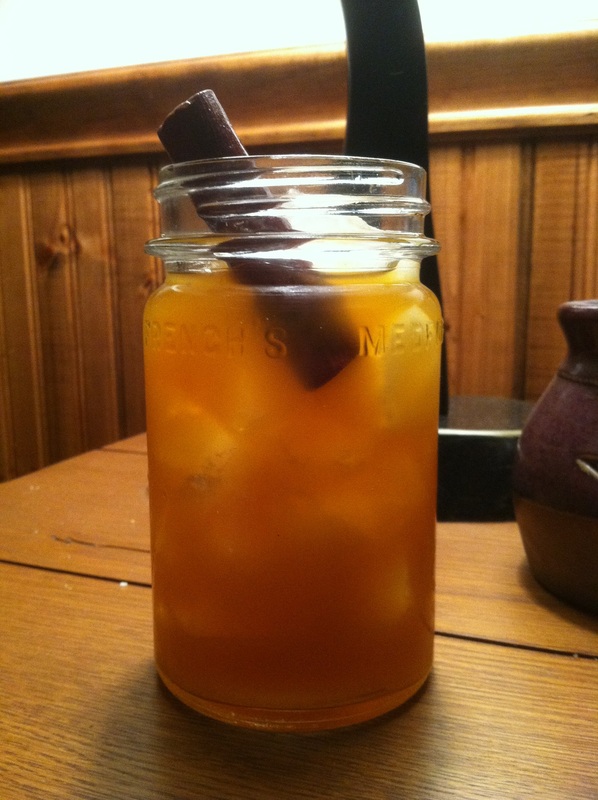 To follow this recipe and have it look like mine, you will need a total of 12 4oz jelly jars. There will be enough pumpkin filling for exactly 12 jars. Place your 12 mason jars on a small rimmed baking sheet. 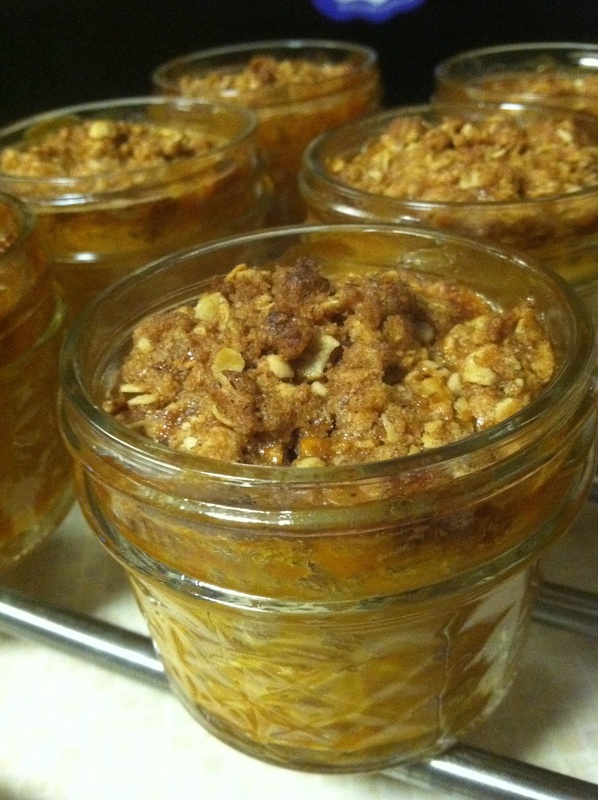 Fill mason jars with pumpkin filling up to the lower rim of the jar (the part underneath the threads for the screw bands – this will leave you 1/2in headspace to put your streusel and still be able to put a lid on the jar). 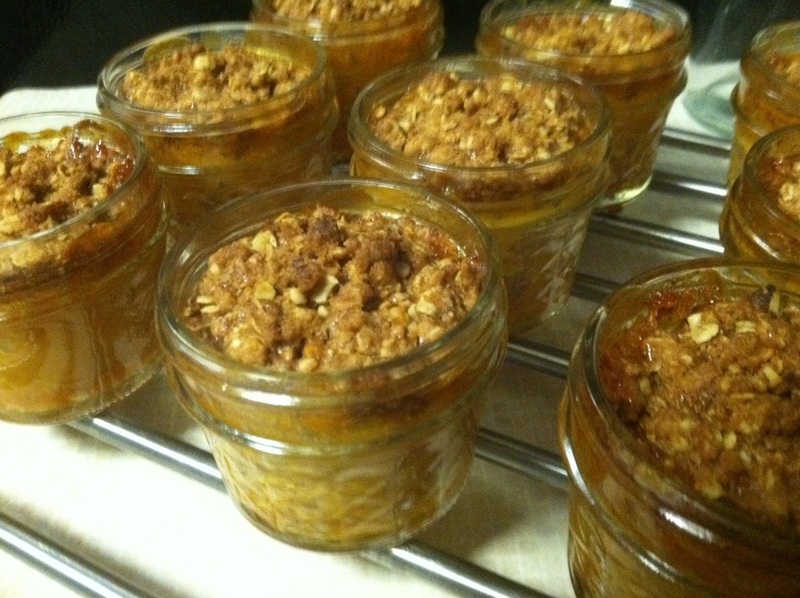 Once you are done with this, sprinkle the tops of each jar with the oatmeal streusel topping – you will have a little bit left over, no worries. Put pie laden cookie sheet in the oven and let them bake at 425 for 15 minutes. After 15 minutes, lower temp to 350 degrees and let bake for 50 minutes. Once they are done, remove them from the oven and let them cool to room temp. Serve with whipped cream or ice cream and enjoy! Any leftover pies, put canning lid and screw band on and store. combine all ingredients in a bowl using a fork or your hands until they resemble a streusel topping. I warned you. 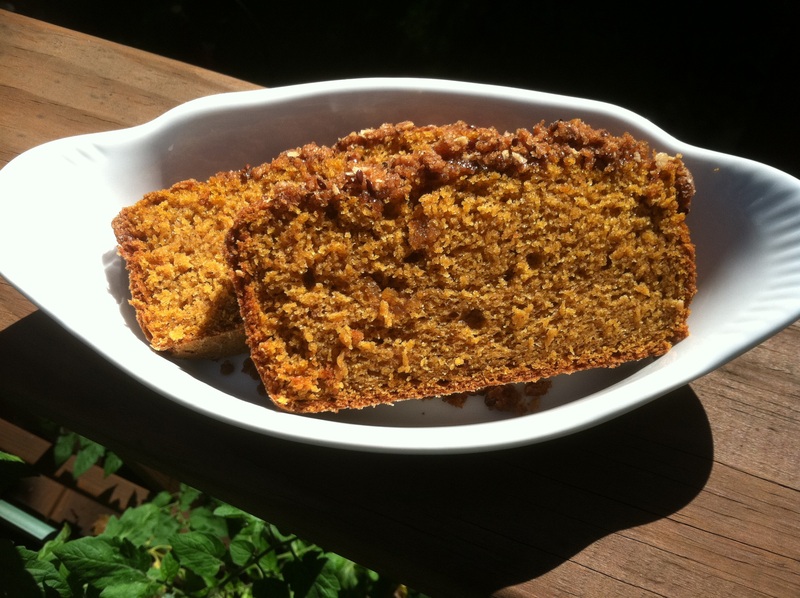 The pumpkin obsession continues with this lovely bread recipe topped with a delicious streusel that is not quite as unhealthy as one would expect! I found this recipe over on Tasty Kitchen. My recipe is the one listed below, which has been modified slightly to meet my tastes. It’s a great bread. Moist and delish without that wet texture that some puree breads can sometimes get. 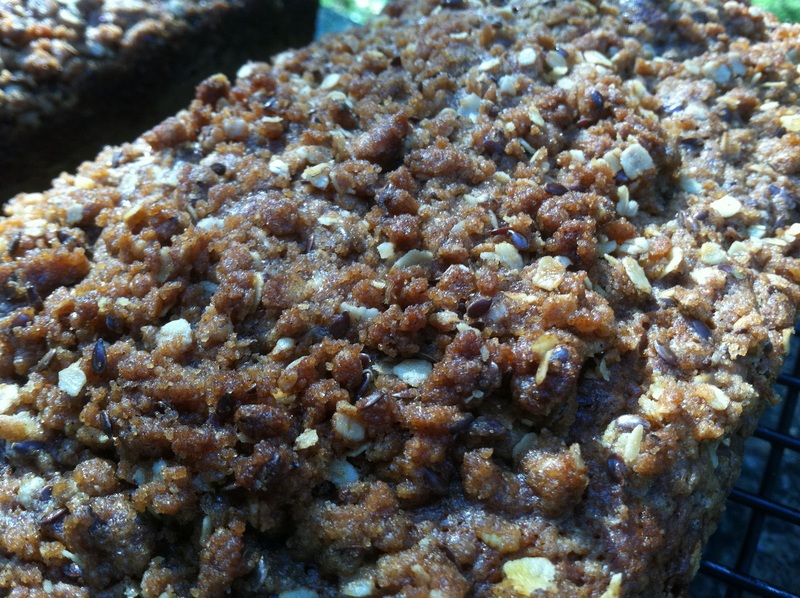 The streusel topping is a great touch and adds a little unexpected crunch. I love mine with some cream cheese or warmed up under the broiler with some real butter. It’s great at breakfast with some scrambled eggs, or for dessert after dinner. This freezes fantastically as well, if you manage to have any left to freeze. Yield is 2 loaves. Spray two 8″ loaf pans with non-stick cooking spray and lightly flour. For the topping – mix together all the topping ingredients using a fork or your hands until combined thoroughly. In the bowl of your mixer, cream together butter, granulated sugar and brown sugar. Add in the vanilla and eggs and mix until just incorporated. Stir in your pumpkin puree. In a separate bowl, add flour, baking powder, baking soda, salt, cinnamon, allspice, and nutmeg. 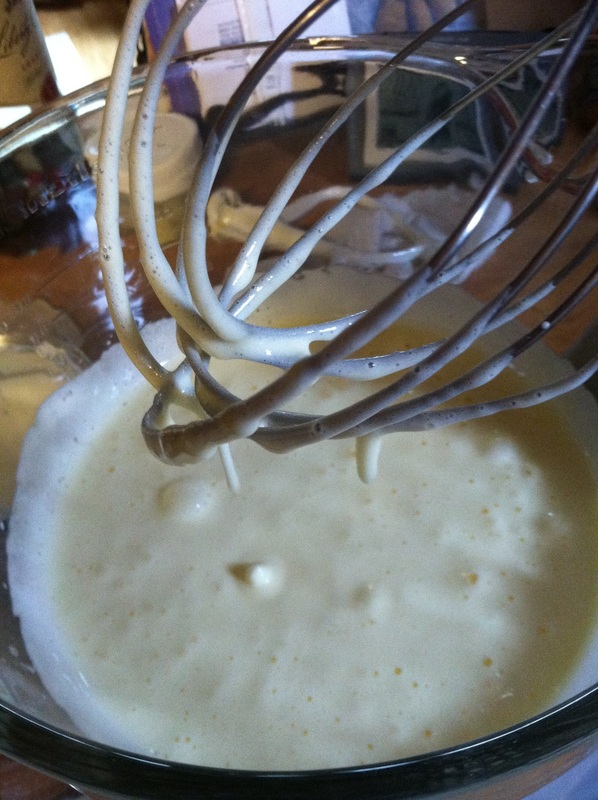 Whisk the mixture together until it looks even and smooth. Add half of the flour mix to the pumpkin mixture, blending well. Beat in buttermilk. Add remaining flour mix and beat lightly until smooth. 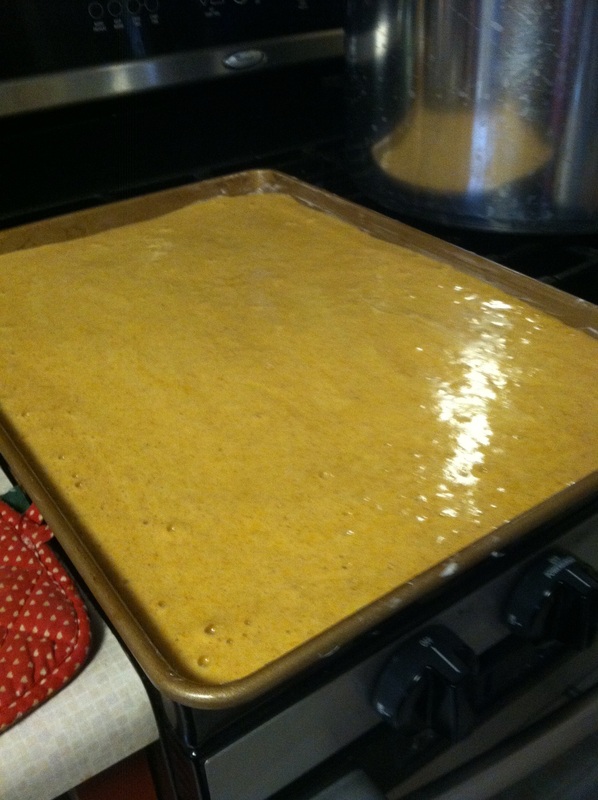 Pour batter evenly into the two prepared 8″ pans. Cover each with half of the topping mix. Bake at 350º F for 70 minutes until a toothpick inserted in the center comes out clean. If additional cooking time is required, do so in 5 minute increments. Remove from pans and let rest on cooling rack. Slice and serve. If freezing, let cool completely and then wrap in a double layer of saran. To serve, let thaw in fridge overnight.